Parents fight to keep kids healthy.. AWESOME! This oft used quote is the rallying cry of many health advocates who are working to improve the environments of low-income minorities. It was used in a presentation by my colleague to motivate parents interested in advocating for their community to fight childhood obesity. She shared it at a monthly convening of First 5 Regional Parents Group in San Pablo, California. Funded via revenue from a tax on cigarettes (Proposition 10) First 5 California provides healthcare, school readiness, child development, and support programs for families of young children. First 5′s Regional Parent Education Group is one such program that teaches participants valuable skills in community leadership and advocacy. As part of the program, First 5 staff train parent volunteers in project management, leadership, community engagement and public speaking. 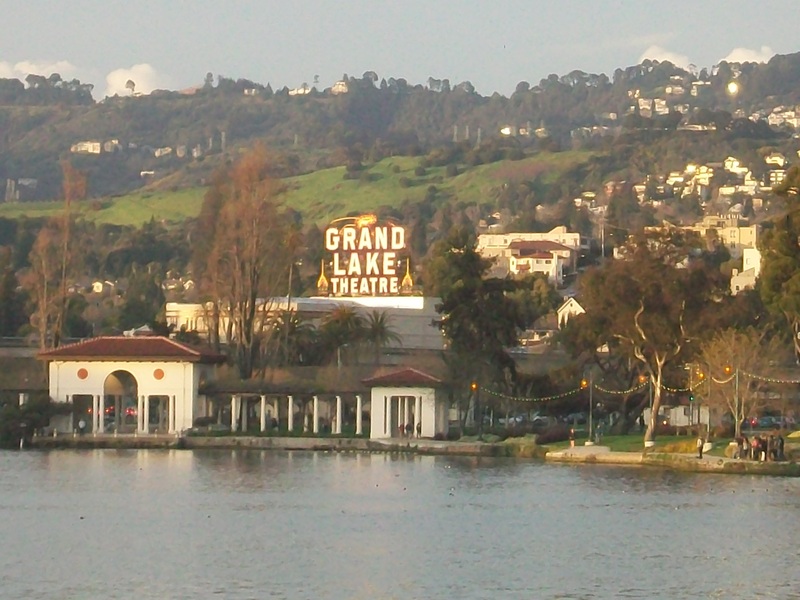 Currently, 150 Contra Costa parents are involved in the program, many of them low-income residents and half of them speak Spanish as their primary language. One of the group’s projects is to provide low-cost physical activity classes for young children aged 0-5. They recognized that one of the barriers to young children getting exercise is that many families live in neighborhoods that lacked clean and safe places for kids to play and learn about different forms of activity, like sports. After doing independent research and surveys, parent group participants found that there was a need for affordable programs for young children to engage in physical activity. They went to the city of Richmond and San Pablo and advocated for classes for their community. They were successful! When asked what advocacy means to them parents shared “the ability to speak for others” “to have power” “to fight for my children”, “to have a voice”. A major problem within low-income minority groups is the history of disenfranchisement and lack of empowerment. Many feel that they do not have the right to protest when fast food restaurants invade their communities or fight for clean parks and safe streets. The First 5 Parent Group in San Pablo says otherwise. When I attended their meeting on Wednesday night, I was inspired by the earnestness, dedication and energy of the parents working to make a difference. I wanted to bottle it up and take it with me! So tell me dear reader..what example do you have of extraordinary people fighting to change their community for the better? Are you doing something to make your neighborhood safe and healthy? Sharing is caring! McDonald’s Makes Happy Meals More Healthy! The Happy Meal is headed for a nutrition overhaul. Bowing to pressure that its kids’ meals haven’t been healthful enough, McDonald’s will downsize french fries and put a fresh fruit or veggie in every Happy Meal. Apple slices have long been an option with the Happy Meal. But the problem has been that parents have to ask for them in lieu of french fries. That’s about to change. via Bowing To Pressure, McDonald’s Makes Happy Meals More Healthful : Shots – Health Blog : NPR. WOW.. letting your voice be heard truly works, huh? Would this satisfy those who feel like we shouldn’t take away choice? Does this appease health advocates? As someone who has a problem with marketing unhealthy food to young children, this is a baby step that I embrace. We have a long way to go, but I appreciate the effort. I have a problem with being misled. Really? Is that what you say in your commercials? I also love drinking! If I am tired and it’s hot outside, I’d rather have a slurpee smoothie. liquid something instead of something to eat. You can’t just have a can of soda or small glass. That’s not going to satisfy. You have to get the big 32 ounce cup! AND it’s cheap. A slurpee is barely $2. Economical, fills you up, and cools you down..that’s THREE birds that I’ve killed! However, I have decided to cut soda and sweetened beverages out of my life. I’m not skinny and diabetes is an unwelcome friend of Love’s family. Why soda? Because soda and other sugar sweetened beverages is the highest source of sugar and empty calories in my (and many folks’) diet. I am lucky to live in Oakland and was blessed to learn a lesson from Alameda County Public Health’s Soda Free Summer Campaign. The Recommended Daily Allowance of Sugar is at most 40 grams or 10 teaspoons per day (4 grams = 1 teaspoon). A 12 oz soda averages 39 grams of sugar. There goes my limit. DANG IT! Out of the many sources of sugar in my diet: cereal, juice, ice cream, tea, candied yams, tooth paste.. soda contains the most sugar with the least reward. I’d rather just have ice cream. That’s 36 grams of sugar, but with dairy and calcium..a nutrient! 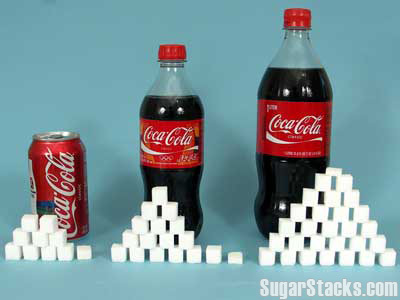 Unlike soda, it’s easy to limit your ‘one sitting’ intake of sugary foods. You can literally drink liters of soda in one sitting. There are only so many candied yams you can eat in one sitting. Armed with this knowledge, over the past two years I have tried to reduce my sugary beverages consumption and drink more water. Yet, I am constantly being coerced, misled, and bamboozled by the beverage industry. In the past, I hated water for a long time. No flavor, no color, no sugar…BORING. I can’t just stop drinking soda COLD Turkey. It’s an addiction. I need a patch or something….. I KNOW..I can drink Vitamin Water. It has some flavor. It’s water with vitamins. I can get healthy and quench my thirst at the same time! One of my favorite flavors was Formula 50, ’cause it’s grape, and I like purple. (I ❤ Purple Rain). 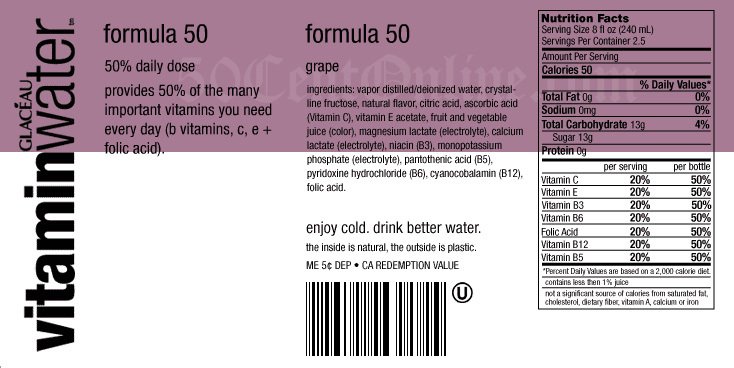 Formula 50 contains vitamins with lots letters (C, B, E). But it also has 32 grams of sugar per bottle (DAMN IT!!). No more Vitamin Water for me! A better alternative: I can quench my thirst and get all those nutrients (and more) by chowing down on some grapes. Vitamin Water doesn’t tell you about the unnecessary sugar in their commercials. They market it as a healthy, better than water, beverage. They know Vitamin Water isn’t all that healthy and their attorneys ASSUME you know it, too. How many of us read those labels on the back? How many of us calculate the nutrients in our diets? How many educated folks know how to read a nutrition label? How many low-income people do? How many African-Americans? Are 50 Cent’s fans reading the label? Part of the reason behind these alarming statistics is lack of education, low access to healthy foods, and economics. Junk food is easy to prepare, cheap and available everywhere, particularly in low-income communities. There is a Mc Donalds, 7-11, or liquor store on every block in the hood. Some people have to travel across town to reach a farmers market or even a Safeway. At the same time African-Americans are targeted with advertisement of unhealthy foods. I am part of the Pepsi Generation. Popeye’s sponsors Black History Month on BET. McDonald’s celebrates Black History 365 Days a YEAR. They are LOVIN’ US! I can’t totally blame soda, or sugary sweetened beverages for being overweight. I know I need exercise more and pay better attention to what I eat in general. However, I have a problem with being misled by false claims in commercials.. Most importantly, I don’t appreciate being lured into unhealthy eating on purpose. And if I, as an educated woman, have this issue what about those who aren’t as educated and don’t have as many choices? The Federal Trade Commission has a problem with it, too. They are asking the food industry change their practice in advertising unhealthy foods to children. If we as adults have a problem with being swayed by unhealthy food marketing, you KNOW our children do, too. They eat what we give them. They also believe Ronald Mc Donald is their friend. The FTC has new guidelines which will be up for discussion in Congress this summer. They are asking for public comment. Do you have a problem with being misled and want to do something about it? Comment on the unfair marketing of unhealthy foods by visiting FTC’s website: https://ftcpublic.commentworks.com/ftc/foodmarketedtochildreniwg/ Do it TODAY! The deadline is July 14th. I learned about all of this a the Childhood Obesity Conference in San Diego two weeks ago. (Shout out to CCPHA, Yale Rudd Center for Food Policy, Makani Themba-Nixon, the FTC and many others!) There should have been a lot more African American’s there. There weren’t a lot of low-income people there, either. They need to know this. I am sharing what I learned with you now. Share this with someone else. Share with me, too! What are some of the ways you are cutting sugar from your diet? What commercials are misleading you? Do you think the food and beverage industry is being unfairly targeted? The sun is out!! What does that mean? Time to go outside and play! Summer is here and far too many people have been sitting indoors all winter and spring and need to get out of the rut. The best way to turn your life around 180-degrees is to step outside this summer and spend some more time with nature. The sun’s healing powers are very real and you will feel like a new person if you commit to getting outside every single day to enjoy the sunshine. Here are 10 great reasons why you should get out of the house this summer. via 10 Reasons Summertime Shouldn’t Be Spent Sitting Indoors. SPARK, a national organization dedicated towards encouraging physical activity to improve the health of children and adolescents, lists some great reasons for going outside (increasing physical activity, getting much needed vitamin D, etc). I say..How could you not take advantage of God’s gift? Feel the warm sunshine on your skin. Take a deep breath and enjoy the fresh clean air. Let the gentle breeze play with your hair. What are 10 things you can do outside? Go to an outside concert. Take beautiful pictures of your city and share with the rest of the world. What are some things that you like to do outside during the summer? 23 million children and teens are obese or overweight.. Some would say that childhood obesity is not a problem. But this kind of statistic is scary..given that health problems that previously were something that adults had to deal with are now diagnosed at much earlier ages: diabetes, hypertension and heart disease. This video posted by SaludToday is about Hispanic children..but has dire implications for children all across America. Particularly the impact of negative marketing and increased screen time has on physical activity and caloric intake. I am a firm believer that obesity is not just a personal issue, but an environmental one. However, after watching this video, what are some actions that you can take to help fight childhood obesity? Do you remember when you learned how to ride your bike? Read how Boston helps to make this rite of passage into a city wide event! Let’s Bike! | Let’s Move. Sarah Palin is allowing bloggers to have the BEST WEEK EVER! She’s bashing the Bushes and the Obamas. No one is safe! Barbara is an elitest (from comments made about the Katrina refugees to Texas), but I think it is AWESOME that she suggests that Sarah stay in Alaska. I agree. However if Palin does stay in Alaska, what would blogger’s like me have to write about? Sarah is a fountain of good blogging material. Take her slam against Michelle Obama and the Let’s Move Campaign. Three minutes into the show Sarah describes how she feels that Obama is an elitist who uses her uppity ideas on how American’s should live to inform decisions on policy. She says that Obama just ‘can not trust parents to make decisions for their own children and what we should eat’ and whines that the government should ‘leave us alone’ and get off our backs. What Ms. Palin fails to understand is that Let’s Move isn’t really about telling parents what to do. It’s recognizing that there are factors that lead to childhood obesity that are out of the parents control. Lack of supermarkets in low income neighborhoods. Portion sizes at restaurants that are exponential. Schools serving pizza for breakfast. Streets without sidewalks and crime just being everywhere. Let’s Move is a collaborative initiative that works with all sectors of society to reduce childhood obesity. Does Let’s Move provide tips to parents such as reducing screen time or taking the kids to the park every once in a while? Yeah. But they are tips..not the LAW. You aren’t going to be arrested for not complying. If your child’s pediatrician recommends serving water instead of juice to reduce your child’s chance of developing Type 2 Diabetes and dental carries are you going to start whining that he is ‘telling you what to do’? It’s what you pay him for, right? You pay the government with your hard earned taxes– wouldn’t it be nice that they put that money to good use such as helping you and your kids to have healthier lives? – Using part of the White House lawn as a garden, bringing kids to learn about sustainable food and harvesting over 1,000 pounds of food to feed the homeless. – Educating the community and parents about nutrition. – Bringing chefs to public schools to improve what is served to kids at institutions where they spend the majority of their day away from parents. – Spearheading an initiative to help local markets and groceries to serve healthy foods. – Providing resources to families that want to go outside. Such common sense thoughts and actions like these miss Sarah Palin by a mile. Which is great! I was wondering what the heck I should write about this week and Sarah Palin gave me the perfect subject. Thanks Sarah!! Keep it coming. To learn more about Let’s Move and what you can do to be more involved in helping reduce childhood obesity- visit http://www.letsmove.gov.